The Sloan Digital Sky Survey (SDSS-III) today announced the most accurate measurements yet of the distances to galaxies in the faraway universe, giving an unprecedented look at the time when the universe first began to expand at an ever-increasing rate. The results, announced today in six related papers posted to the arXiv preprint server, are the culmination of more than two years of work by the team of scientists and engineers behind the Baryon Oscillation Spectroscopic Survey (BOSS), one of the SDSS-III’s four component surveys. The record of baryon acoustic oscillations (white rings) in galaxy maps helps astronomers retrace the history of the expanding universe. Figure Credit: E.M. Huff, the SDSS-III team, and the South Pole Telescope team. BOSS scientists announced these results today at the National Astronomy Meeting (NAM) in the UK and will present them at the American Physical Society (APS) meeting in the US on Sunday. These new results provide the best measurements yet that directly compare the distance to galaxies 6 billion years ago and the cosmic microwave background from 13.7 billion years ago. This measurement is thus a key part of determining the nature of dark energy that is currently accelerating the expansion of the Universe. 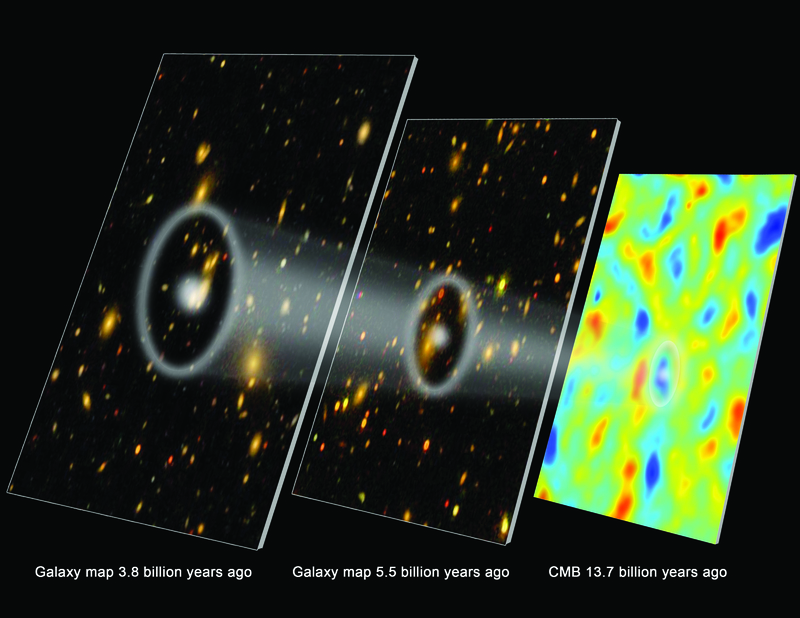 The BOSS results focus on the era when dark energy first emerged as a significant player in the Universe. By understanding how it began to dominate the Universe’s expansion, SDSS-III scientists hope to be able to reveal more about this mysterious substance that makes up 70% of the mass-energy of the Universe. Time to accept reality: dark E/m YOK. Higgs YOK. The universe is a two-poles entity, an all-mass and an all-energy poles. Singularity and the Big Bang MUST have happened with the smallest base universe particles, the gravitons, that MUST be both energy and mass, even if all of them are inert mass just one smallest fraction of a second at the pre-Bing Bang singularity. All mass formats evolve from gravitons that convert into energy i.e. escape their gravitons shatters-clusters, becoming mass formats in motion, i.e. energy. And they all end up again as mass in a repeat universal singularity. Universe expansion and re-contraction proceed simultaneously. Graviton is the elementary particle of the universe. The gravitons are compacted into the universal inert singularity mass only for the smallest fraction of a second, when all the gravitons of the universe are compacted together, inert, with zero distance between all of them. This state is feasible and mandated by their small size and by their hence weak force. The Big Bang is the shattering of the short-lived singularity mass into fragments that later became galactic clusters. This is inflation. The shattering is the start of movement of the shatters i.e. the start of reconversion of mass into energy, mass in motion. This reconversion proceeds at a constant rate since the big bang, since the annealing-tempering of singularity and the start of resolution of gravitons. The release of gravitons from their shatters-clusters proceeds at constant rate due to their weak specific force due to their small size. Gravity is propensity of energy reconversion to mass. Since the Big Bang galactic clusters are losing mass at constant rate. Mass, gravitons, continue escaping at constant rate from their Big Bang fragments-clusters thus becoming energy, mass in motion, thus thrusting the clusters. Constant thrust and decreasing galactic clusters weight accelerate the separation of clusters from each other. Plain common sense. A commonsensible conjecture is that the Universe Contraction is initiated following the Big-Bang event, as released moving gravitons (energy) deliver their thrust to other particles and are collected by and stored in black holes at very low energy levels steadily leading to the re-formation of the Universe Singularity, simultaneously with expansion, i.e. that universal expansion and contraction are going on simultaneously. The conjectured implications is that the Universe is a product of A Single Universal Black Hole with an extremely brief singularity of ALL the gravitons of the universe, which is feasible and possible and mandated because gravitation is a very weak force due to the small size of the gravitons, the primal mass-energy particles of the universe.